Venomized #1 Review – AiPT! A well-paced and plotted issue that turns some of your favorite heroes into Symbiote versions of themselves. Cullen Bunn and Iban Coello kick off their next big Venom event this week with Venomized. The title is rather self-explanatory as an alien race comes to Earth to turn all our heroes into Venom. But why, and what is the danger of being turned into a Symbiote wearing hero? This is a universe sweeping event so if you dig Marvel heroes you’ll wanna keep tabs on this to see how it changes things. Captain America, Spider-Man, Wolverine; they’re all here folks! This issue plays out like the intense first 30 minutes of a good movie. Our favorite heroes aren’t aware an attack is coming and it comes shooting out at you the instant this issue starts. The first victim is the Xavier School so if you’re an Generation X fan you’ll be hyped to read this one. 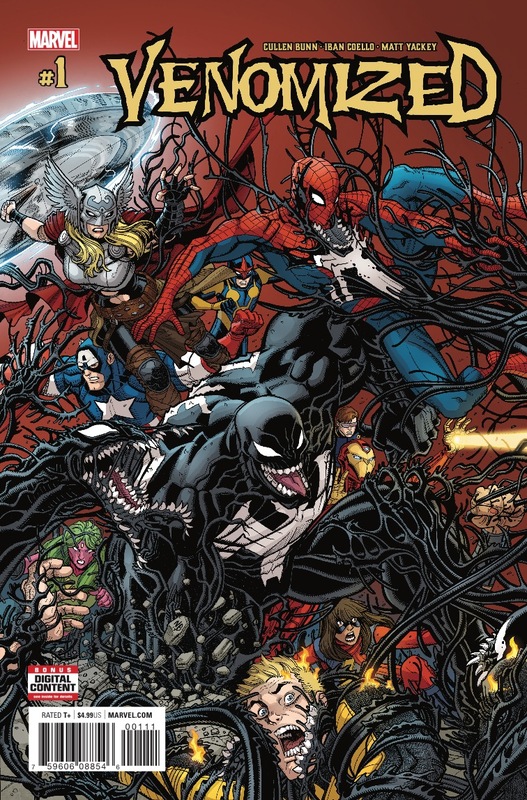 As the story progresses Bunn reveals each major player as well as a major character who was instrumental in the finale of Venomverse. The intentions of the villains aren’t quite clear yet, but one can hazard a guess it means getting eaten by the Poisons. Coello continues to draw some clean looking symbiotes and his designs for the various heroes who get one are quite cool. A favorite of mine is Old Man Logan, who sports a cool blue and white look. He also nails some iconic superhero poses that aim to homage classic tales. Considering how many characters pop it’s a solid showing on the art side of things. The pace of the book is quite good too never letting up or dropping into an exposition dump. That is owed to the art and the writing, of course, and as far as action-adventure books go this will keep you entertained. The same issues I had with Venomverse crop here, which includes not really caring what is going on. It doesn’t help that Jane Foster Thor is in this story, which dates the comic and makes it slightly less interesting since we know it’s not in the now. The main hook of the series seems to be how cool Symbiote versions of the heroes look like. It’s also pretty important to have read Venomverse simply so you know who the Poison alien race is and why they’re even in the Marvel Universe at all. I didn’t hate this first issue, but it continues to showcase the same problems I had with Venomverse. If you dig Venom and the Symbiote as a character you’ll get a thrill out of seeing the heroes “venomized” but as of this issue there isn’t quite enough here to make any of it matter. A good first issue that's technically well made, but you'll get a somewhat hollow feeling from it all.